In the late 1860’s, Hanover was a thriving village. The Pastor of Second Presbyterian Church of Newark started bi-weekly services in Hanover in the fall of 1867. Eight people were the cornerstone of Hanover Presbyterian Church in March 1869. Eleven more people joined the church at a communion service in March 1871. With the church growth, the congregation felt that they could have weekly meetings. Worship was held in members’ homes until the use of the town hall was granted. In November 1871, an organizational meeting was held for those interested in founding a Presbyterian church in Hanover. Thirty-six people signed a covenant stating they believed that God was blessing their decision. The church continued to meet in the town hall while plans were being drawn for a new church building. 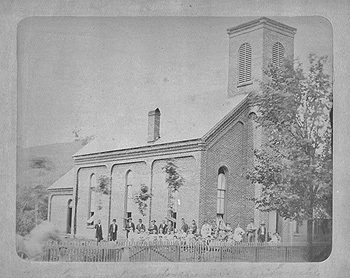 On November 17, 1872 the new church was dedicated. The church bell that is still in use today was purchased on October 14, 1875. This church building served the congregation for eighty-eight years until the Dillon Dam Project brought about the demolition of the school, homes, stores and churches in the area. Ground was broken for the new church at its current site on North Main Street in October 1959. The dedication of the current church building was held on August 7, 1960. A two story addition was added to the church in 1979. This addition included a nursery, enlarged kitchen and handicapped accessible ramps to the lower level as well as additional seating in the sanctuary and office space on the upper level. In 1998, an education wing and fellowship room was completed to better serve the congregation and community. This addition includes individual classrooms, church office and Pastor’s study.